September 1999, the last year of the 20th century… RC and I got married. Y2K was a letdown, and we are still alive and kicking! In a recent interview on Humans of New York HONY the Series a comment that really struck me was “money will come back. You can never get time back”. This week never a truer statement was said. Today as I think about an easy, tasty anniversary meal to prepare on this 30C day, years of fond memories and triumphs interrupt my thoughts. So, so many I can’t begin to choose favourites. I also pause for a moment to be grateful that Iphones, texting, Instagram and Facebook didn’t exist. Everyone attending our wedding was present :). Some folks have since passed away, or simply drifted on. We have even both lost our original wedding rings 😦 such is life. We’ve shared a series of dogs – seven so far, lived in a few different cities, eaten a lot of good food, attended a lot of shows together, spent almost two years (not consecutively) living in an RV with at least three dogs, and recently started a significant new chapter in our lives together. We didn’t do any of these things alone or in a vacuum – it takes a village right? Our wedding was a beautiful day, and our marriage is a beautiful world to exist and dream within. I wouldn’t change a thing. Happy (18 +5 years) Anniversary RC! A few weeks ago I had a reading done at my local “crystal/tarot/incense” shop as I like to call it – (I never rememb the actual name). The reading was interesting, and I always take things with a grain of salt – but, the main theme was if there is something you want to do, start doing it. Writing on RoadNoises is something that I love to do – so here I am. According to analytics I have 36 followers, all of whom I am certain have lost sleep waiting for my return to the keyboard – I am sure with as much anticipation as season 8 of Game of Thrones. I have been hiding out for several months now, figuratively and literally. Not really saying or doing much – definitely not reaching out to the universe. Yes everyday, brings challenges, adventures and gifts. This year the practice of gratitude needs to be more than me just saying thanks out loud. What does genuine gratitude look and feel like? Something to ponder. 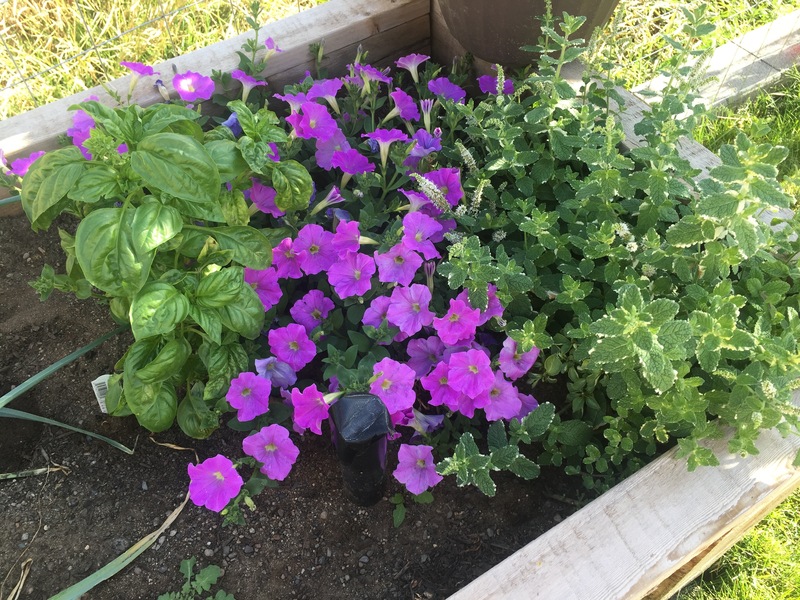 I my new garden I planted some basil. Picked it up for cheap, possibly free with some dying onions starts and a few petunias. I have never had success with Basil. 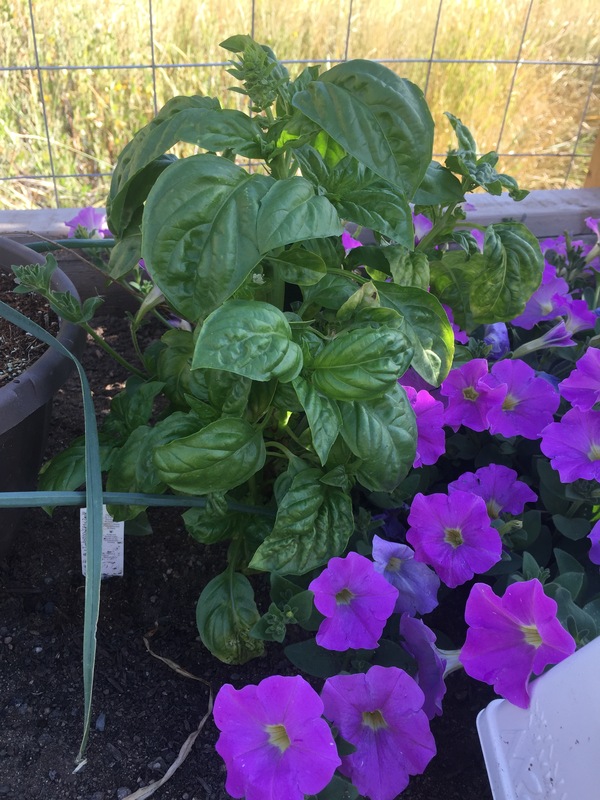 Regular Basil, Thai Basil, indoors, outdoors it has never thrived. I buy a plant, put it in the garden and basically condemn it to death. A tall stick with 3-4 leaves might appear, but never anything more. The other day I was checking out the garden. Should I water? What’s the point? 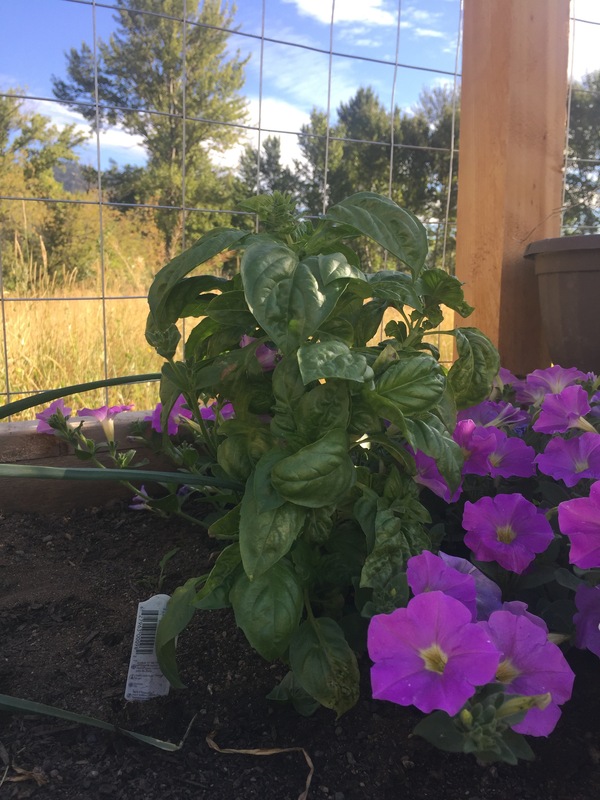 Summer is over… And I discovered the Basil – did a double, then triple take – there he was in all his glory, surrounded by a petunia and pineapple mint – all thriving. My sister was disgustedly jealous to hear the news of my new found basil success – and it was delicious in a peach salad. Yes, a huge time lapse since my last post in May. I was originally going to introduce the puppy, but as you can read it turned into a memorial tribute. The house is still relatively quiet compared to when Cider was here, but it has an amazing new energy that of course really only a puppy can bring. Foundling Age – 6 weeks? Photo 1 – Foundling Age ( 6 weeks? ), Photo 2 Age I saw him on Bandaged Paws FB Page, Bottom Photo – First Day with Us – (5 Months?). In all Archer – the ??? possibly Samoyed/Border Collie mix has been easy to train, virtually non-destructive and a source of entertainment and laughs. At approx. 9 months there is definitely a little remedial training that could happen, but in all he has turned out to be a gem. I have to credit the rescue and foster family for a large part of his socializing and demeanour. Earlier in the summer I was at the vet clinic having him weighed (he needed worm meds ugh). Hanging out in the reception area showing him off and chatting with the vet she agreed he was probably pretty much full grown, and more than likely part Samoyed. Showing him off to anyone that was interested a woman walked in to pick up some dog food – she asked me about him. What he was, where he came from etc. I said I didn’t really know, that I was told he was found at about six weeks old wandering alone in High Level. She stopped, and just gushed – ” oh he is a little foundling”. She was just about in tears, and went on to say how lucky we were to have found each other. I have to agree – this little Bandaged Paws rescue mutt, the little foundling has definitely brighten up our summer days. I have been waffling on what to write about this summer, if I should write. I will write. I have decided that I like the idea of writing seasonally, it is less stressful, finite in expectation and can easily be started up again. 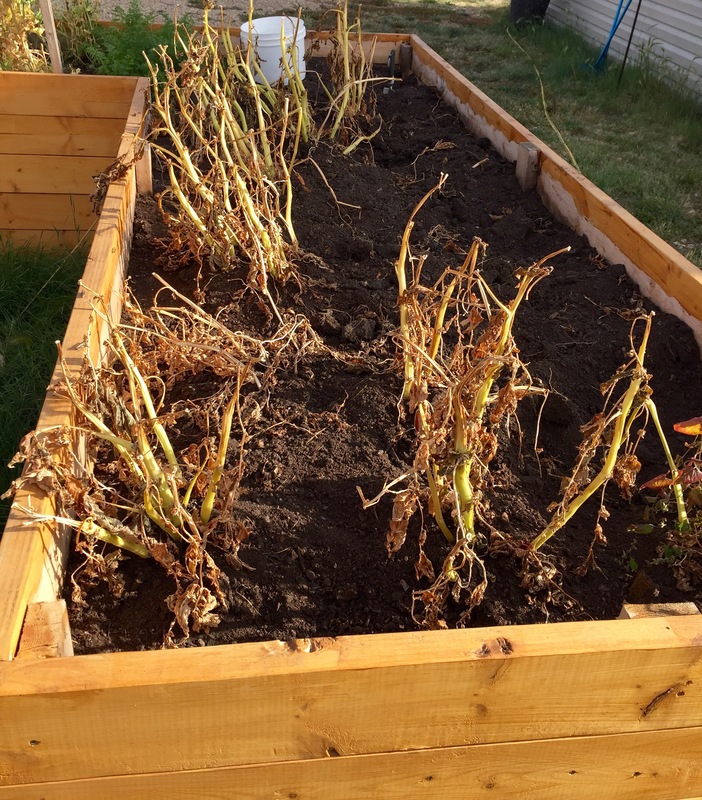 This year I was going to document season two of the garden – while the garden is starting to sprout, and a self watering system was retrofitted in April, it just isn’t doing too much right now. It could be construed as an example of what my (our life) is like these days. Seeds sown, water applied and I am patiently (?) waiting the plants to grow and bear fruit. Undoubtedly, there will be some garden commentary but I don’t feel it will be the primary focus this season. This past winter while mild, seemed a very long one. Transition, growth, expansion, change – not always welcome at the time. When I’ve moved through them and can reflect, it is possible however to see the lessons, and feel true gratitude. Of course I am not going to claim those feelings are instant! There are some changes that are never expected and certainly never easy to experience. If you have ever had a pet, one that you’ve cared for and grown attached to, you will know what I am talking about. If you have never had a pet that you truly loved, told your secrets too, and recognized unconditional acceptance in their eyes, I feel badly for you. I hope you may realize there is still time and that you may in your lifetime know the calming affect a beloved pets presence can have at the end of a long trying day. That you will feel joy in your heart as they run toward you in a delirious state welcoming you home. That you might have the privilege to love and care for a pet, that will leave you feeling profound loss, knowing you did all you could as your hand strokes their downy soft brow, while they exhale their final breathe. I have had dogs since I was a nine years old. To this day I tell everyone with babies and small children that mention getting a dog, “wait until they are nine”. No scientific reason, other than it was a good age for me to experience my first dog. Needless to say 22 years later, RC & I just adopted dog number seven. We’ve had four pedigreed registered dogs, and now three mutts. More about number seven in a bit. Cider, aka Cid, Cidre, Cidey, Cider Jane, dog four was my first mutt. 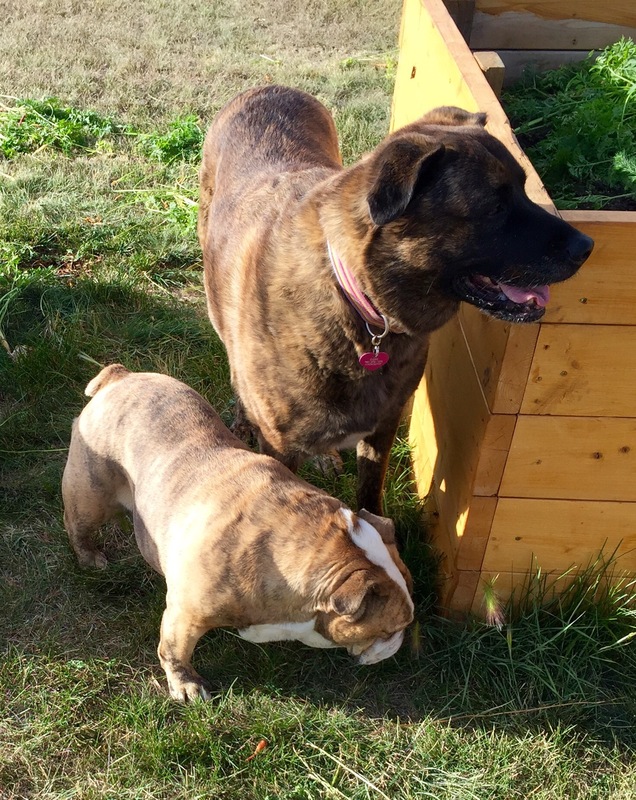 I found her on Kijiji – for sale Bullmastiff Shepard Mix. We had a bullmastiff – so that was good. I refer to her as my trailer park rescue, from a litter of twelve. When I first went to check out the puppies they were just lying on a blanket on the floor. I was mortified. I was let into the house by a young boy about fourteen years old, and his younger sister led me to the closet where the pups were. There were no adults or parents in sight. I left there a bit worried for the children, and the puppies. Needless to say about 6 weeks later I went back and picked up my girl. Fast forward nine years. Cider started limping out of nowhere. Maybe she’d slipped on the ice, it was everywhere. That didn’t seem right. I watched and observed, and things did not seem to be getting any better. I had my suspicions – bone cancer – but didn’t want to be accused of being a hypochondriac by proxy. After two weeks, and several vet trips it was confirmed. By now she was uncomfortable, and staying still most of the day. We couldn’t risk having her leg break, so we made the appointment and held to out promise to always care for her and never let her suffer. Cider wasn’t the first trip to the vet – and it doesn’t get any ease. I really think she knew, and that she was grateful. That being said, I was not expecting the devastation that I felt as I lay on the clinic floor next to her, babbling on, attempting to make it seem better, knowing I couldn’t. Just being there for her, and thanking her for the lessons she provided. She was the hardest dog I have ever had. I had to be pretty innovative at times – and (thank her for the carpet finally being removed)… Oh Cider. 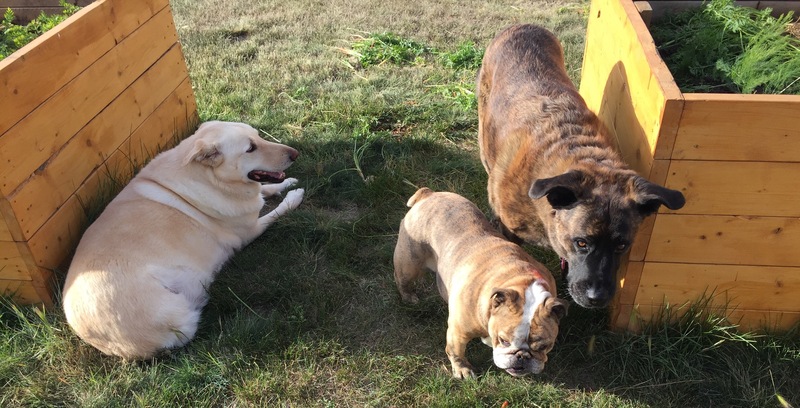 She was gone – Home to Frankie and Diesel, without her. This is the part where I could go on at length about how they knew when we left what was up. They knew she wasn’t coming home. They got to say “good-bye”. I wish that I had brought them (note to self). They knew. When I brought the ashes home a few days later, I showed them to Frankie and Diesel. 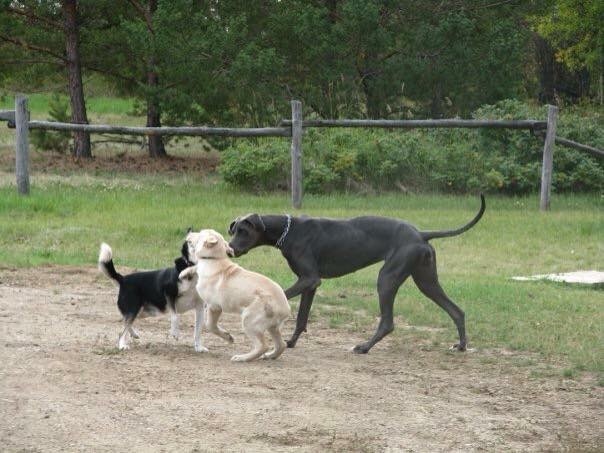 Frankie turned her head away, and Diesel went crazy trying to get at them. I have never seen him behave like that before. By the end of April, two months later he was still moping. On friend described him as melancholy and morose. I knew he was glum, but again wasn’t sure if I was simply transferring my emotions about Cider onto him. Multiple people commented on his obvious sadness. I wasn’t really thinking of getting another dog, but as fate would have it I stumbled across one on a local rescue group’s page about 3 weeks ago. More about him soon. As I write these words, I have to note, that all of my dogs found their way to me. The right place, the right circumstances. Whatever pre-conceived ideas I may have had about what my dog might be, or look like always get thrown out the window as the right beastie finds me. They have found me via classified ads in a printed news paper, magazine articles, chance encounter at a dog show, friend of a friend, kijiji, spca blog, and most recently a Facebook page. Always when just turning pages, scrolling through or innocently watching confirmation and wondering – “hey what kind of dog is that”? Cider lived a good, and full life. Well cared for and loved by many. A dog that suffered from severe separation anxiety, and a multitude of behaviours I could never quite put my finger on. I am so grateful that RC and his friend were studying together everyday in January, so she was never alone and had company and walks for what turned out to be the last weeks of her life. I must give thanks for Cider, and all the lessons learned. She was a good teacher – and touched me in a way I had never expected. She was my brown eyed girl. 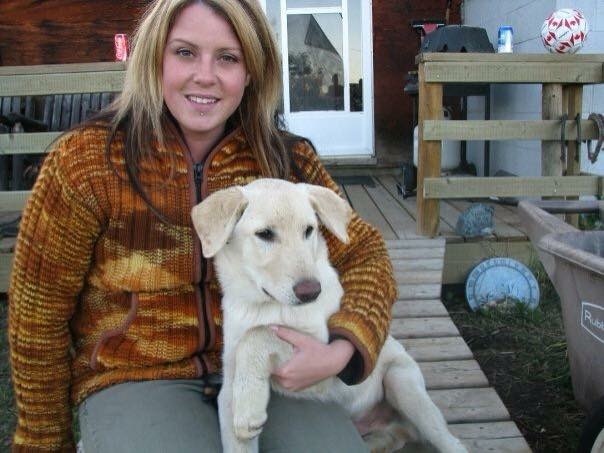 I love all my dogs past and present, but she was the dog that took care of me. When I was sick she would fret, she would check on me. When I was rushing she made me slow down. When I was sad she would do something to make me laugh. She taught me about boundaries, and body language, and how to accept her just the way she was. 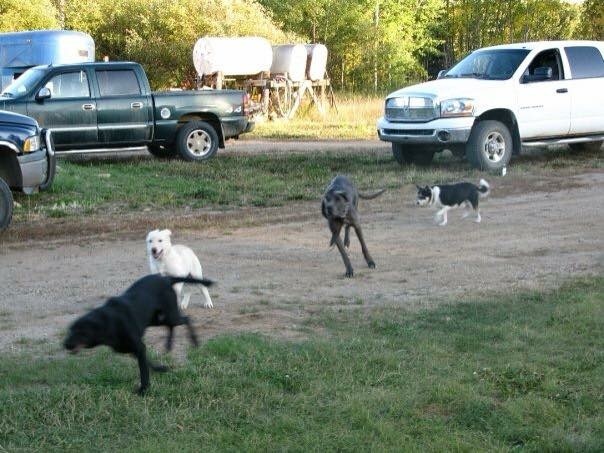 I know she is barking and running through the brush with her old pals Guinness and Duncan. Spring is finally here… according to the calendar. This year just may be the year of the greenhouse! There is a lot of thought going into this project. I don’t want to mess it up, type, size, materials, location. There is still snow on the ground here, with shaded areas continuing to hold moisture in the form of ice. Wandering around the property yesterday, it occurred to me that although it’s ten acres, we have a tendency to keep things in a little island clump surrounded by prairie. If only roads and gravel didn’t cost so much!! All of the above! However, the location will need reclaimed. A small chain link pen with designed to protect the cats heated winter shelter, that has become a crap catch all for broken down pots, and random bits and pieces will need to be cleaned up and relocated. A little extra work that I am ok with. Ironically when I suggested this location yesterday (before finding the check list online) I was met with opposition. Today is a different day. 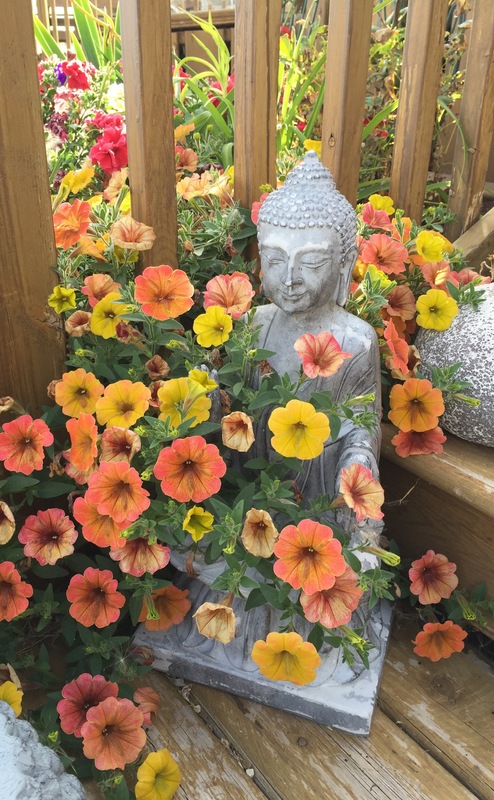 Reclaiming the location is the perfect opportunity to continue the Buddhist practice of non-attachment that will weave itself through the the season. The easy location is wrong on most counts except protection from falling tree branches, and only because there are no trees. 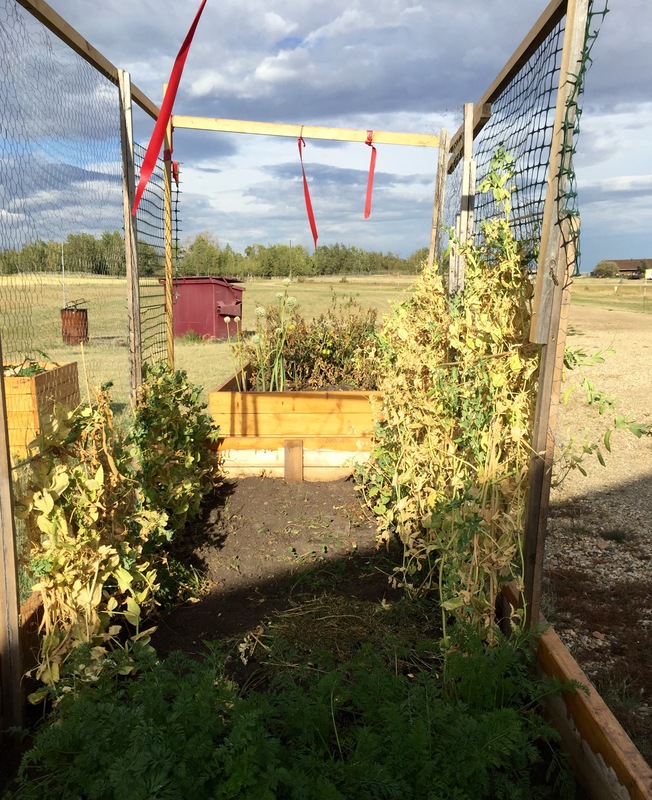 This exercise in determining greenhouse location is proof that doing the lazy, easy thing so often becomes preferable to doing the right thing. Could this be the theme of this year gardening/food growing journey taking shape? The easy/finite way or the value generating/capacity building way? There have also been a lot of references to Nordic culture, and celebration of events like Yule, Imbolc, and Ostara so perhaps a little blend. I am so blessed with the little piece of sanctuary I live on. To not consider the value generating capacity would be to actively reject this blessing. My thoughts turn to other events of the weekend. Time spent with family, sunny afternoons contemplating and planning the greenhouse and gardens, and an Easter morning visit from a moose cow and her yearling twin calves. They didn’t stick around too long, but they are proof of abundance, a reminder that I made it through another winter and that optimism is good. Standing in the garden this evening, the sun hot, the dry plants making crinkling noises, grasshoppers looking like pea pods it seemed fitting to acknowledge that the growing season was over. 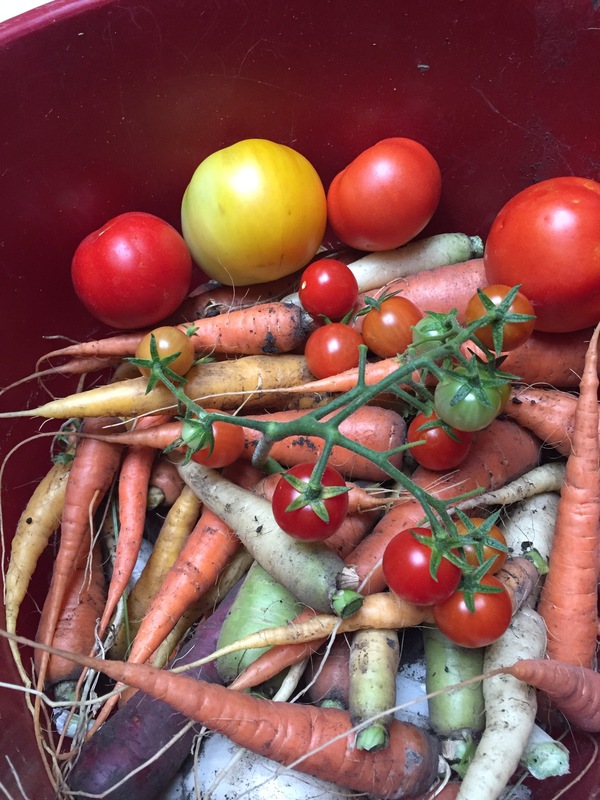 Time to practice non attachment and move into the next phase – final harvest and seed collection. One week ago, a frost hit and I picked as many tomatoes as I could. They are in a box ripening. 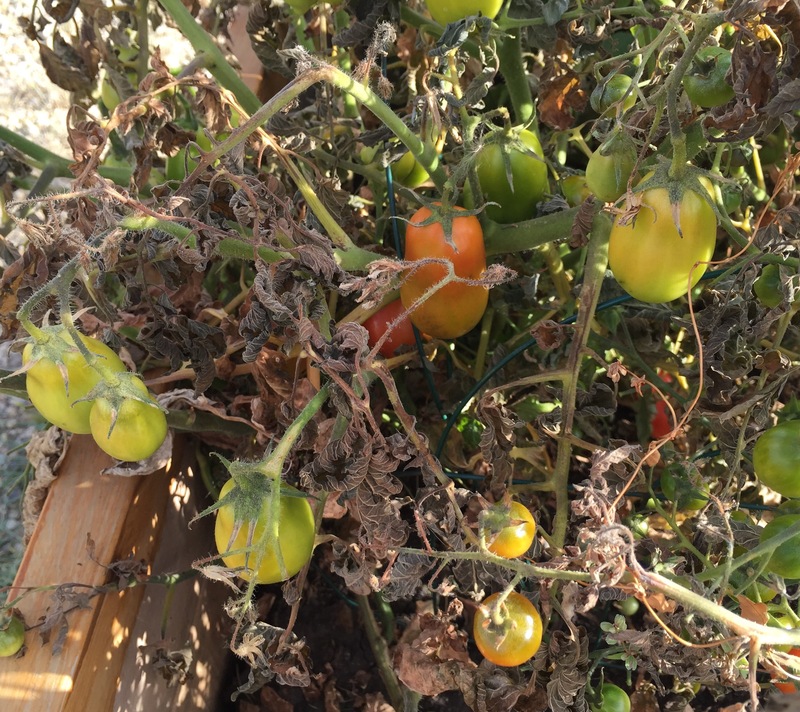 Today – the tomatoes are clinging on and ripening. Go figure? Start to finish I’d have to say I’ve learned a lot about the garden. It’s moods, the vegetables and flowers growing there. Lists of changes I’ll make for next year. 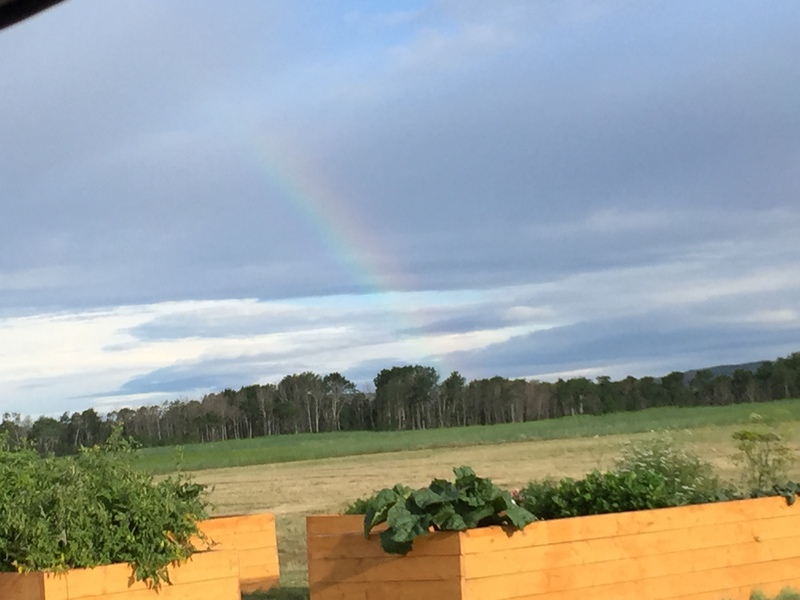 Adjustments to soil, locations, plant choices and watering systems. The full moon arrives at the perfect time to wrap up the journey of Winking Beagle Gardens until next spring. Setting intentions for the next lunar phase and preparing for back to school fresh starts and winter projects. Northern Lights have been seen in the past few days – in the upcoming darkness I’ll be more present and ready to enjoy the nature on my doorstep. So much happening, it’s back to school prep time at work, and “summer” is over. The garden is really starting to slow down. However, the bounty continues. I just bagged and froze over four cups of rhubarb from my one little plant. 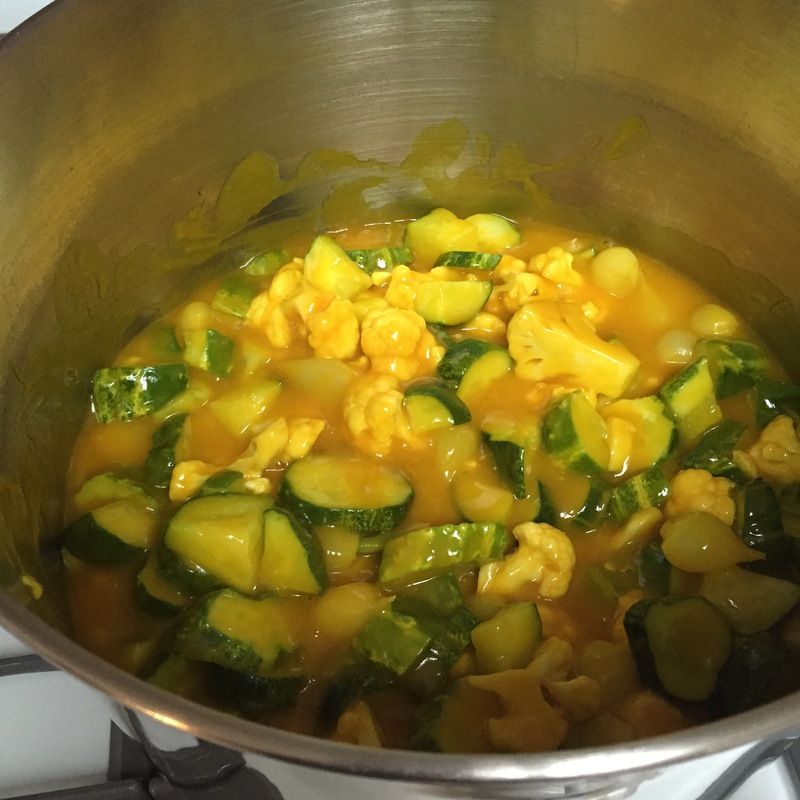 I also made my first batch of mustard pickles!! 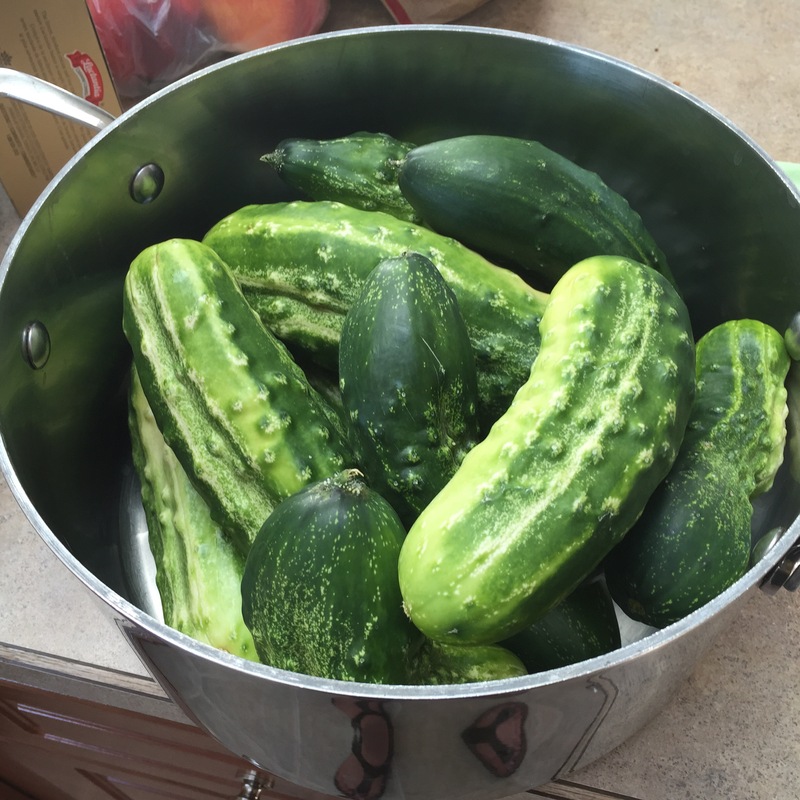 The cucumbers from the garden, and I splurged on an organic Cauliflower. I was smart (I think) and canned multiple small bottles to avoid having to store a giant bottle of pickles in the fridge for an undisclosed amount of time. Fingers crossed!! 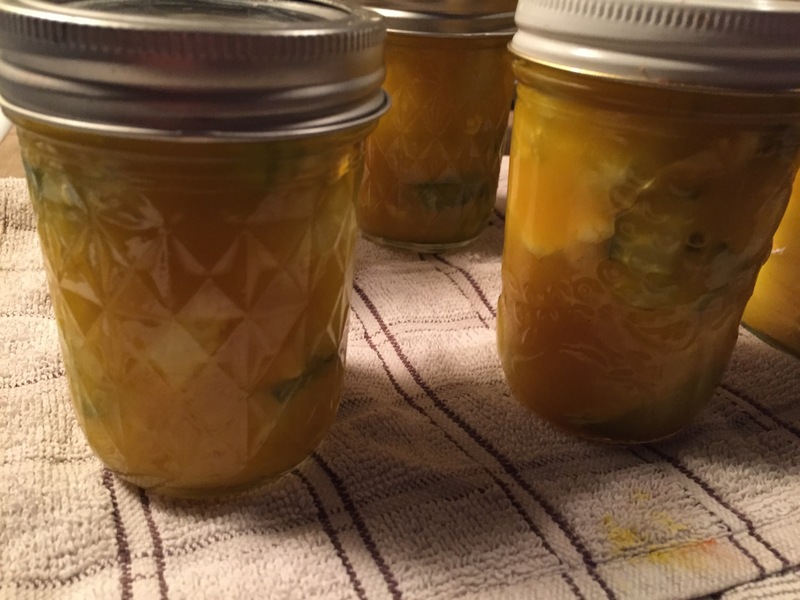 I also tested my canning skills re-using jars without snap lids. Everything has popped and sealed so I am very optimistic. The mustard tastes just like the mustard in our favourite commercial brand Rose Pickles, that should be well received. At this point, I am waiting for them to cure and eat them with roast beef and classic Newfoundland Jigs Dinner. 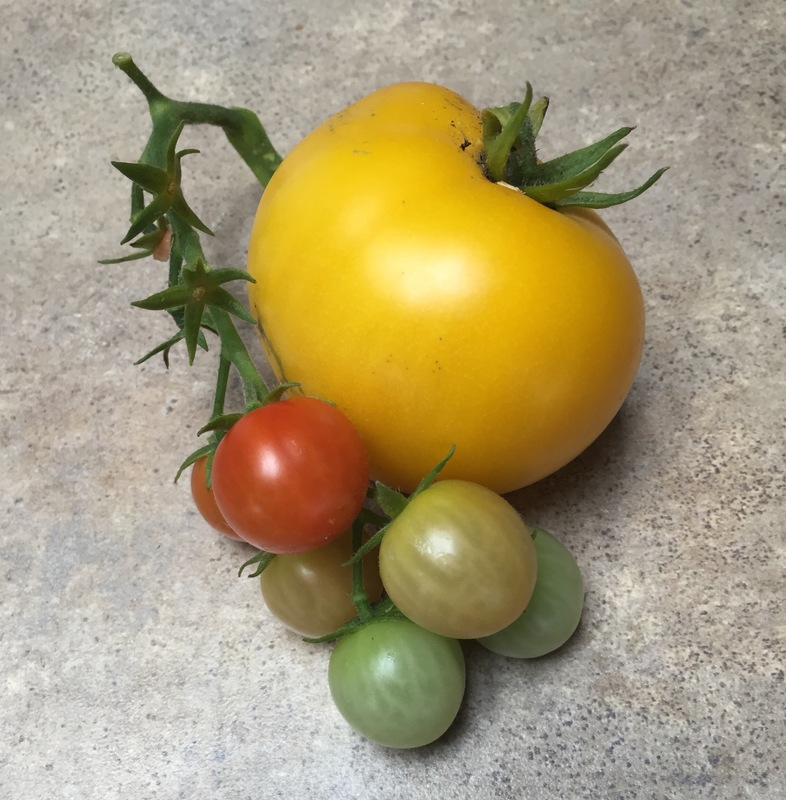 The tomatoes are taking over – I picked a handful of Cherry every morning, and come home each evening to couple of beautiful yellows. The Romas and Beefsteak are coming along nicely. Contemplating trying tomato jam – that will be a first. Carrotts, potatoes and herbs going strong!! I have to confess when I placed my rhubarb next to my Saskatoon berries in the freezer, and little surge of pride had to be acknowledged. Of course I then went straight to thinking about frozen food in the event of complete power grid break down and possible Zombie Apocolypse… Where do these thoughts come from?? 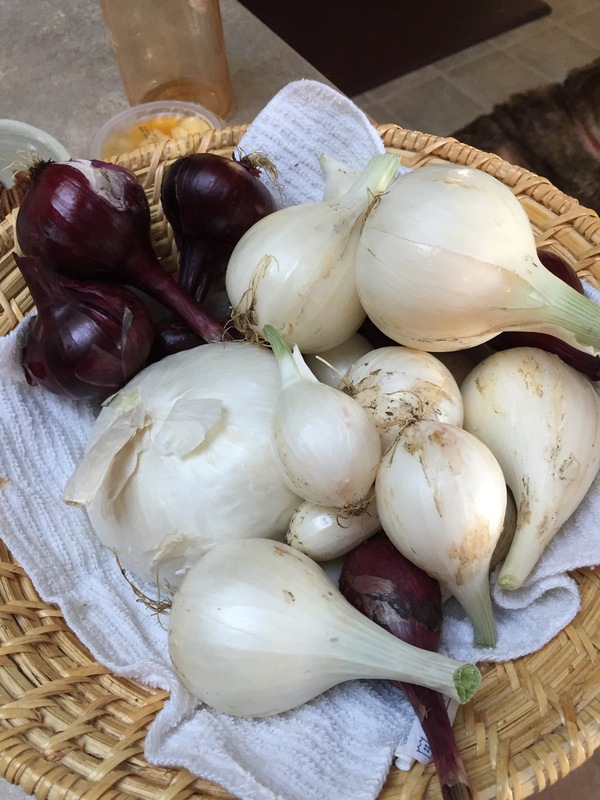 A few photos of the harvest while I contemplate the next phase of the garden and impending weather changes. Surrender and non attachment in full force this Sunday!! I am not even sure where to start with this tale. Not really garden related, but a throw back to earlier posts about dogs etc. As a dog lover and Facebook user, I am a sucker for cute puppy pics, rescue stories and online resources regarding senior dogs, animal rescue, pet therapy, special needs pets and happily ever after stories. 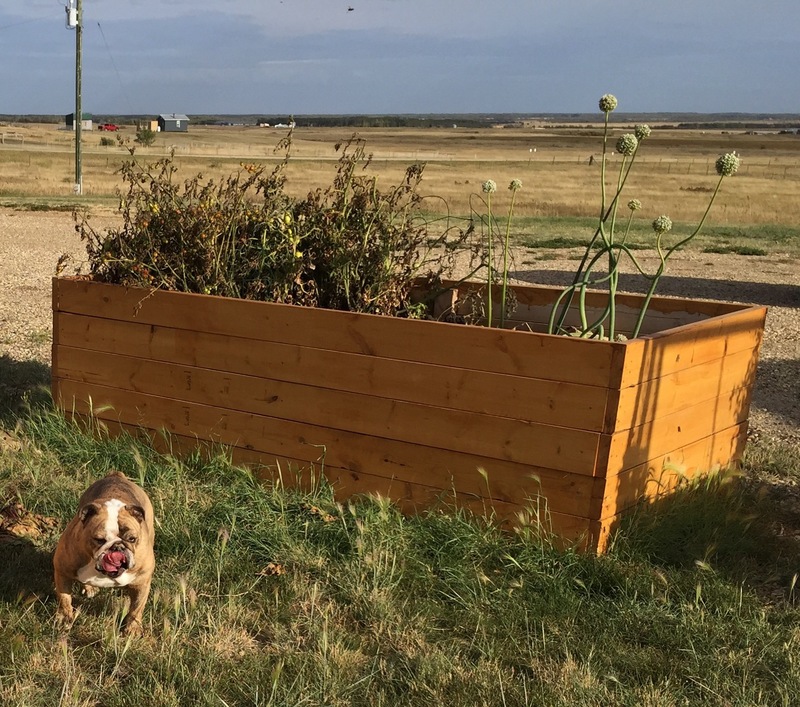 That being said I am also a member of a few Facebook groups – including the Grande Prairie Dog Enthusiasts Club. I have never met any of the members in person, but check in often. It’s just a forum to talk about training, dog sitters, debate the pros and cons of raw versus kibble diets. Many cute photos and stories of the members pooches and hi-jinks find their way on the group page! Last night I was on Facebook checking messages ( I am also a recent online bidding wars participant) for my auction sales. Part of the fledging minimalist living project RC and I have embarked on. Baby steps right? On Sunday RC cleaned out his closet. I debated the bidding wars page, and was wavering between Sally Anne and auction. We set up a photo set, shot everything and ended up with over 30 lots for auction. 27 lots sold!! So, checking messages – I discovered there are actually two inboxes!! Hmmm I see a message from April, 2015 asking how I came to have Diesel. The message sender K – thought he might have come through a rescue she was running 5-6 years ago. I had to reply! A conversation ensued, and she had indeed rescued him from a woman that had become overwhelmed with her own good intentions – found him a home with a family (this is where he jumped out of a truck and ended up with one less leg). They had him for a little over a year – moved to the city, decided it was too much work to have him in town. They contacted K, and she asked them to hold onto him for a few more days until she could get sorted. They later informed K, they had found a home. In reality they had surrendered him to the GPSPCA (where we found him) see an older post Diesel Dreams. Understandably upset at hearing she had been duped – K was thrilled to hear he was in an amazing home (mine of course). The best part !! K has puppy pics, and some video!!! He was such a cutie! Diesel is about 5-6 years old, and has been with us for almost 3 of those years. He had a journey to get to us, I hope it was worth it. I had to pause for a moment and reflect on my truth – I doubt I would of been drawn to him as a puppy “not my type” and probably wouldn’t have looked twice if he had four legs ( I like to “rescue” the underdogs…). K and Baby D. Too cute – trouble maker I am sure! He never had a tail! Apparently he is a Lab/Rottie/Dane mix – not so sure about that. If he could talk I am sure he’d fill us in on how he learned to shake a paw, why he talks so much, what drives him to guard, who started his love for being brushed and vacuumed and why he insists on hanging out in the mud bogs! 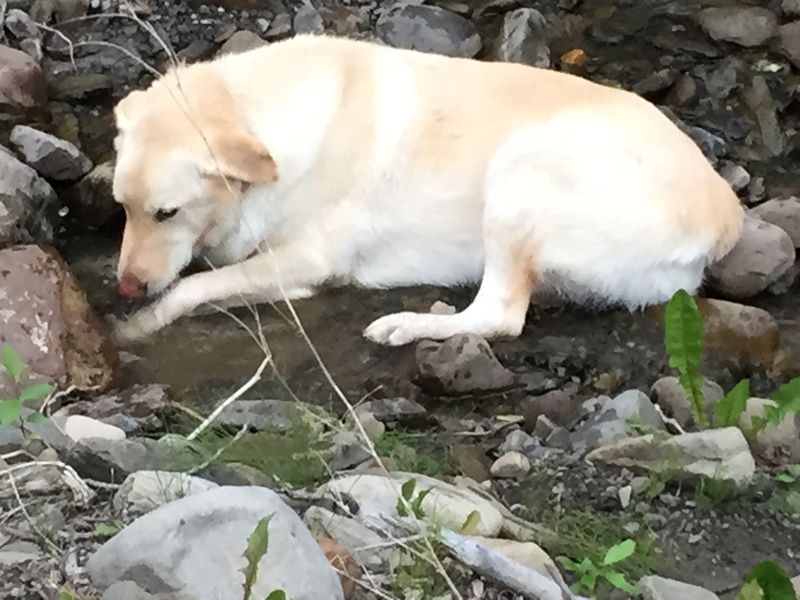 I am THIRSTY and this is a creek, must lie in it for best water drinking experience! We love him and I’m pretty sure he loves us! Thank you Facebook! Yesterday I watched episode 1 of The Dust Bowl an amazing documentary mini series on PBS. I feel that in a previous post, I had no idea what I was talking about when I was complaining about the wind and that is what the Dust Bowl must have been like. Well so wrong- yes it’s windy here but nothing to complain about. Tonight I’m watching the second episode and they talk about the drought and grasshoppers. 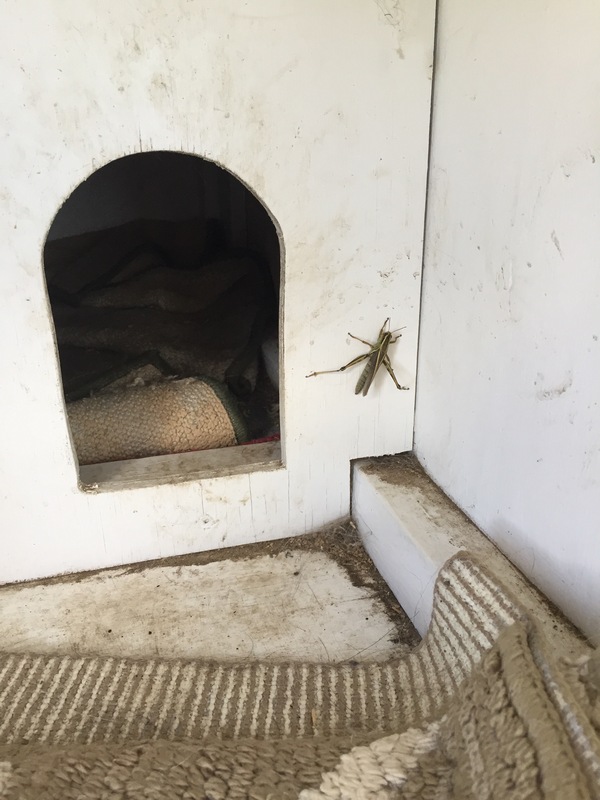 It has been dry here, and every step in the garden flushed out hoppers. They haven’t destroyed my garden, but I can see how they could. 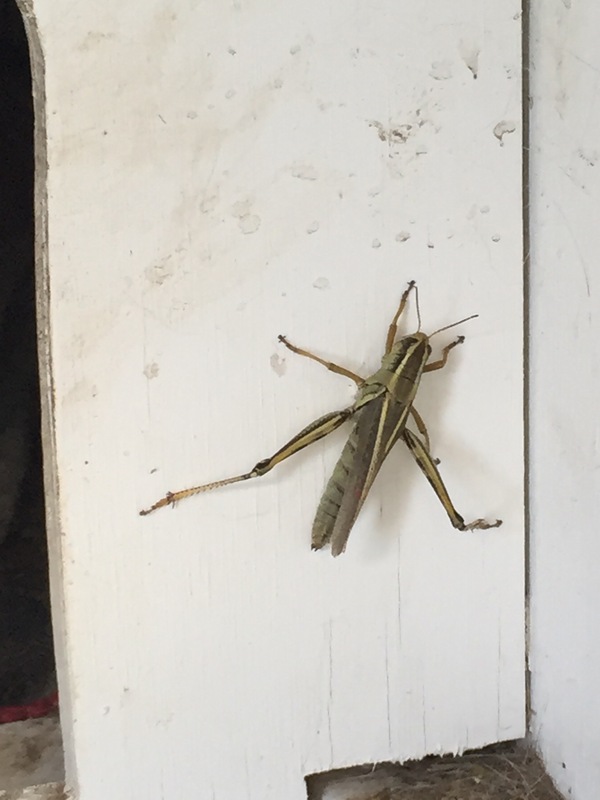 Yesterday I found this guy about an inch long- the biggest one so far. Imagine them flying through the sky in swarms so large they blocked out the sun. I can’t.